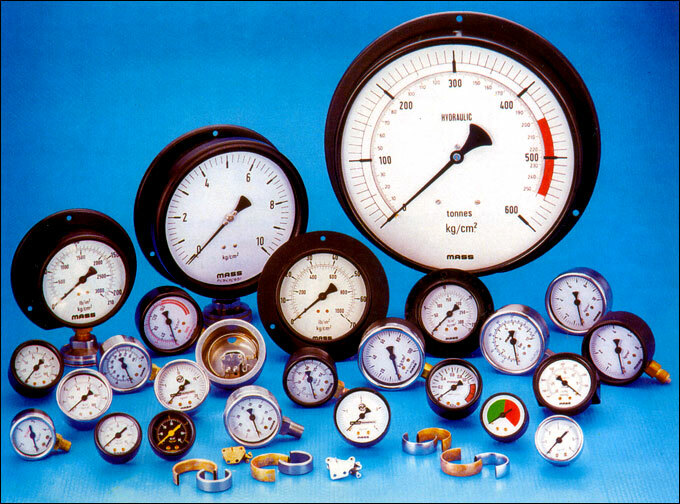 MASS make Utility Pressure Gauges are available in 40, 50, 63, 80, 100, 150 & 250mm dial size. These are specially designed for valve positioners, airfilters & regulators, small boilers, fire extinguishers, pharmaceutical & food processing equipments, pumps, compressors, hydraulic & pneumatic systems, ammonia & refrigeration services. Quality Control features carried out on each gauge. Leak test -Overload test - Calibration and Accuracy test - Hyteresischeck -Thread check by ring gauges - Visual Inspection of finishing of internal components, dial printing, paint of dial & casing, entire assembly of gauge & final packing for shipment. Accuracy + 2% of f.s.d. Joints S.S. Bourdon tube tip and the socket ends are ARGON ARC WELDED and phosphor bronze bourdon tubes are silver brazed / soldered. Bourdon tubes are heat-treated and stress relieved. All utility models start with suffix " C ". Follow decodification sheet for details.